Dale Brooks is a much loved and respected Director of the Friends of the Logging Museum. He is also one of the historians for the town of White Pines and the Blagen Mill. 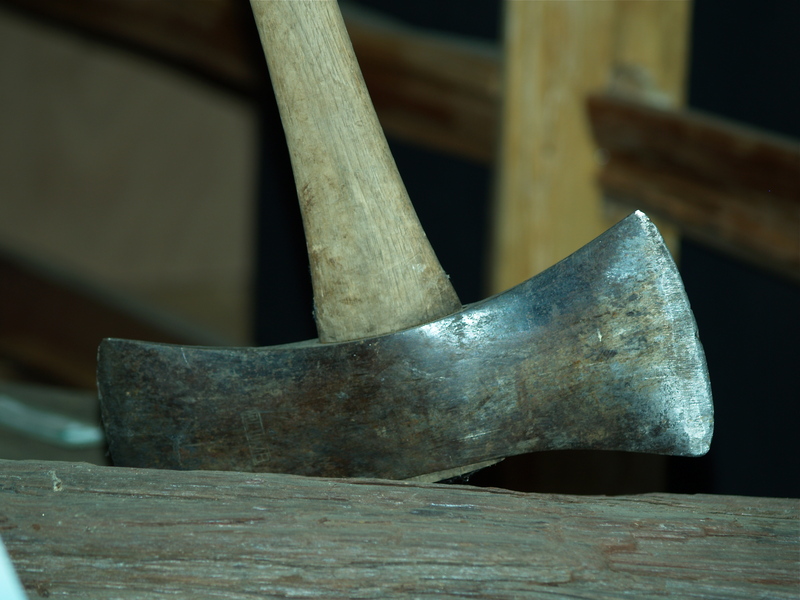 This is his story of the axe and his family. Dale’s biological father got run over in a fruit orchard in Orangevale, CA when Dale was nine months old. A neighbor of Bess and Dale Brooks in Orangevale was a Mrs. McKinsey (spelling?) who also had a house in Sierraville. This connection made her Orangevale home a wintering-over place for some of the loggers who worked in the Sierraville/Calpine area. Among these winter boarders was Jerry Blasdell, who also kind of watched over Mrs. McKinsey’s grandson, Bobby. Editors note: There is a connection here that I’ll get back to, one of these days, soon. On October. 31, 1938, Bess and Jerry ran away to Reno in a borrowed car to get married. Jerry had a 1934 Ford with the legendary suicide doors, but perhaps this car wasn’t up to the trip over the Sierras. Jerry was working for Doc Linebaugh at Calpine, and before Bess and Jerry left Sierraville, Doc had given his wedding gift to Jerry. It was a double bitted axe. 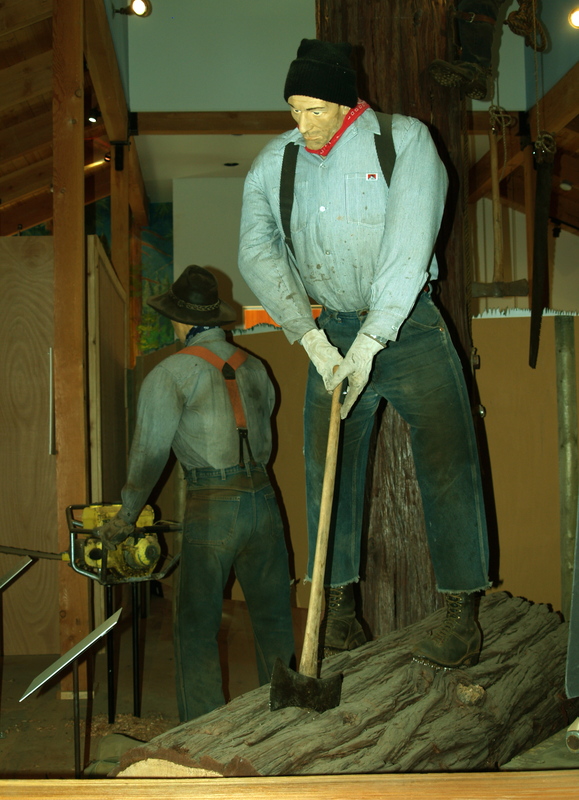 This axe is in the Logging Museum’s exhibits with a logging mannikin having just sunk it into a log. You can see it there. On Jerry and Bess’s first trip to White Pines (I suspect it was an exploratory trip) Jerry got his car stuck in the red mud that made up much of White Pines roadways at that time. They had to get a Cat to pull them out. Dale, Bess, and Jerry moved to White Pines in April, 1939 and lived in a 16 X 16 tent in Dunbar Meadow near where the museum is now. That winter, there was a big push for logs and Jerry remained in White Pines, living in a 3 man logger’s cabin whereas Dale and Bess returned to Orangevale. In the spring of 1940, the family returned to their tent which was put next to one of the cabins, and a lean-to was added, running along the side of the cabin and the tent. This lean-to was half bathroom, and half kitchen. Dale remembers that they had a remarkable stove that served both as their heat and as the cook stove. The stove was about 18″ by 18″, had four lids on top, and a door on the front. That little stove heated the tent, the lean-to, and the cabin, plus his mother did all their cooking on it. They lived in that set-up until 1940, when they moved into one of the logger’s cabins, which Jerry purchased for $400. That cabin had originally been sold by Doc Linebaugh for $200. The editor finds it interesting to find the commonality between the $200 that Mr. Blagen got for the lots in White Pines proper, and the $200 that Doc got for the cabins that sat on the land that was not included in the price of the cabin. So a buyer could buy a lot for $200 and own it, or buy a cabin for $200 and not own the land upon which it was sitting. About 1950, they bought a cabin close to where the tennis court is in White Pines Park, and their neighbors were the Pete Bowmans who lived where the lowest corner of the Hazel Fischer School parking lot is now. Dunbar Road now runs between where the two houses were then. The Blasdell cabin was actually two cabins put together to form a Tee or an Ell, Dale doesn’t remember which. When Dale graduated from the 8th Grade at Avery School in 1943, he went to Orangevale, and lived with his uncle, where he worked in a fruit shed, and then atteneded San Juan High School until Spring when he returned home and enrolled at Bret Harte High School, from whence he graduated in 1947. Now for those that are pursuing the history of White Pines and the logging families’ housing: That cabin had been built by the father-in-law of a White Pines family, the Grunders, a man named McGinness (spelling), who forgot to put a door in the cabin. No problem, he would crawl under the cabin and come up through the floor. For the sake of those keeping track, McGinness sold that cabin to Percy Kinsman, from whom Jerry bought it. Jerry died of a heart attack in 1951, while Dale was working for Brown Dolley’s road crew, as a truck driver. Dale and Bess continued to live in the two-cabin cabin until 1965, when American Forest Products forced them to move. AFP was planning on subdividing along San Antonio Creek from White Pines to Camp Connell. They had put in what is now White Pines Lake in order to create an attraction to lure buyers to their planned subdivision. The requirement for a sewer system and treatment plant apparently ended that plan. Dale and Bess bought the lot where Dale now lives from American Forest Products for $600 and had a house built on it. Now, what about that axe? That axe meant a lot to Jerry because it was a great axe, and besides that, Doc had given it to him. 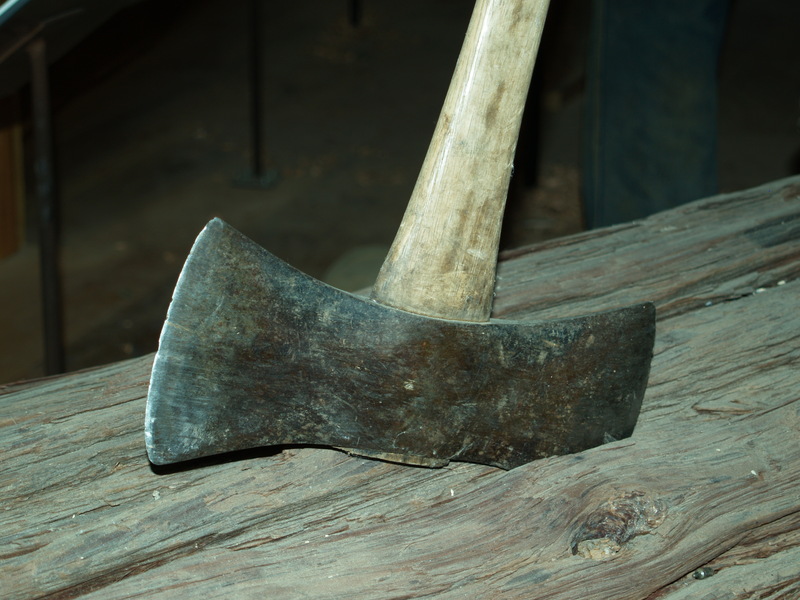 That axe was treated with loving care, until one day: Dale, Bruce Linebaugh, and a couple of other early teenagers were building a “camp” in the lot next to Dale’s house. There were some sapwood remains from some cedar rounds that had had shakes taken from the outside wood. The guys were splitting the sapwood into boards from which their camp would be built. That darn axe they were using wasn’t sharp enough, so Dale went home and got the wedding present axe. Whoops, missed the round, hit a rock, and put a big nick in the blade. Dale took it home, said nothing, and hoped that Jerry wouldn’t notice. Jerry did notice and Dale was grounded for a long time. How could Jerry miss it? It and others are still there today! Another interesting side story is one about Jerry’s brother, Charley. Charley was a powder monkey for Doc and his job was blowing stumps out of the ground in order to allow roads to be built. In 1944, in a moment of carelessness, one of Charley’s explosions ended up breaking Charley’s leg and he was taken to the hospital in San Andreas, which at the time had only a couple of beds. Dolly, Charley’s wife, didn’t drive, So, Dale became her chauffeur and got to drive Charley’s new pickup, which Dale saw as a bright spot in the otherwise gloomy situation with Charley’s accident. Editor’s note: In 1944, during the war, a 1941 pickup was probably considered new. With havin so much written content do you ever run into any issues of plagorism or copyright violation? Do you know any techniques to help prevent content from being stolen? I’d definitely appreciate it. In our case, we pretty much don’t care if people borrow our stories or even our photos.Our job, at least as I see it, is to get the history out into the public. So, someone copying something that we have on the web site, at the very least broadens its exposure. Our photos on the web site are pretty low resolution, so if someone wants good copies of those, they have to request it.